Jordi Colomer will stay in Trondheim from the end of July on and he will work on a new project in collaboration with RAKE visningsrom. An important element of the project is an iconic car park-building from 1964, located in one of the main avenues of the City. The building itself will become a large part of the installation as a temporary exhibition space. The opening will be on the 5th of September, 2014. The variety of mediums called forth by Jordi Colomer's work and the transversality of his judgement undoubtedly are linked to his fragmentary education as architect, artist and art historian in progressive 1980s' Barcelona. Beginning with the "Alta Comèdia" (High Comedy) exhibition, performed in Tarragona in 1993, Colomer began to fuse his sculptural work, elements of theatre staging and architectural references. From those years on (in particular after he discovered the German avant-garde cinema of the thirties), video started to stand out as the main mediator in the relationship the artist had with performance art, theatre and sculpture. In 1997 he showed his first video work at a site-specific projection room built inside the Barcelona Museum of Contemporary Art (MACBA). This strategy enabled Colomer to superimpose theatrical space, the installation as an inhabitable sculpture and cinematographic micro-narration. That was how he produced pieces such as Pianito (The Little Piano, 1999), Les Jumelles (The Twins, 2000) or Le Dortoir (The Dormitory, 2001), which would complete a period marked by work in extreme film set constructions, where the set entirely determines the characters' behaviour. 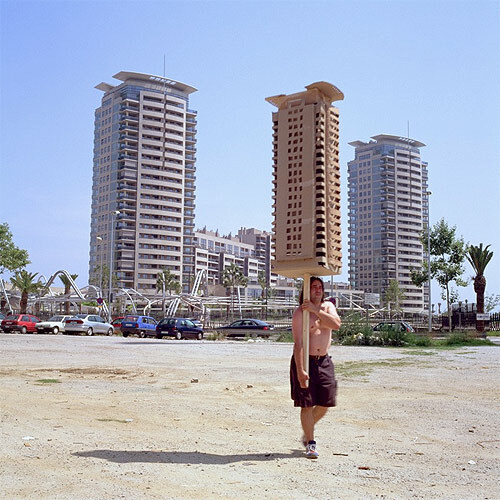 From 2001, Jordi Colomer's staging investigation extends to urban space and an exploration of the different scenes of social life (neighbourhoods, streets, deserts, rooftops…). This phase of his work is determined by journeys -maybe because they allow him to keep a foreigner's viewpoint of the different urban sets he is seeking or rediscovering. This is what led to works such as Anarchitekton (2002-2004), a travelling project involving four large global cities (Barcelona, Bucharest, Brasilia, Osaka), No? Future! (filmed in Le Havre, 2004) or Arabian Stars ( Yemen, 2005) among many others. It is also behind his most recent works En la Pampa (In the Pampa, made in the Atacama desert, Chile, 2008), Avenida Ixtapaluca (houses for mexico) (Mexico, 2009) or The Istanbul Map (Istanbul, 2010). These are journey-works where the issue of movement keeps coming back, and where the isolated actions of a character condenses reflection (but not without a degree of absurd humour) on the possibilities of poetic survival offered by the contemporary metropolis. Jordi Colomer is currently participating at Manifesta 10, Saint Petersburg (Russia) until October 31, and "Beyond the Supersquare" at Bronx Museum NY (USA), till January 11, 2015.